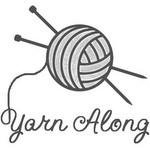 Welcome to another week of Yarn Along with Ginny! Go and take a look at what everyone else is knitting and reading this week over on her blog. I’m still reading Stephanie Pearl Mc-Phee’s latest book: ‘The Amazing Thing About the Way It Goes: Stories of Tidiness, Self-Esteem and Other Things I gave Up On’. I’m about half-way through and I’m beginning to think there is no knitting content within these pages! It is a departure from her other books where between the stories of life, there is always knitting. Perhaps all the knitting stories have been told, for now? Nevertheless, I’m still enjoying it and the tales or truths she tells. As she reflects about stories of her own life, it makes me think of mine. I could never jump hurdles myself either. I have been knitting feverishly on my Hooray Cardigan. I’m up to the rather large button bands, and then still have the sleeves to do. The good news is, I can throw the cable needle away because that part of the project is complete. In other knitting news, my 7 year old niece Mary has taken to knitting with great gusto, and without my involvement! I was so excited to hear about her keenness, that I took over a ‘few’ supplies to nurture her enthusiasm. A friend at work has also taken up knitting recently, and this week I helped her complete her first cowl by stitching it together for her. Hooray for new knitters! I hope to have a picture heavy post next week, sorry about that.